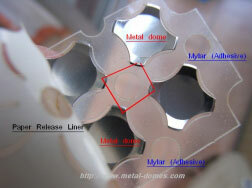 This type of metal dome array (dome array) is used in the early period of metal dome arrays (dome arrays) industry. Metal dome contacts are attached under Maylar (one layer of adhesive PET film). On the sheet, there is an air hole for each dome contact and it is essential for good click-feeling. Nice handle & returned dome with breathe freely hole on metal dome. Mainly used in cheap single layer PCB.